I treated myself recently. In a very BIG way. I flew all the way to the good ole' US of A for a shopping trip and to meet up with some virtual friends I had only ever ‘met' before online. That's me above about to burst with excitement and disbelief at all the fabric – a gazillion yards in every conceivable color, fiber and weave. Sigh – shopping heaven. This is Mary Jo's in Gastonia. A fabric shop that's as big as my town center here. 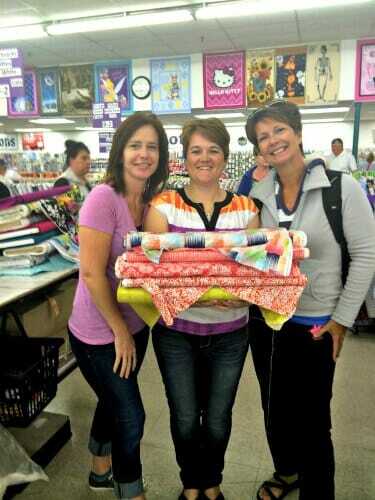 I went to Charlotte, NC and met up with some of my online sewing friends. This is us enjoying a lunch – the coffee shop had more choices for food in one place than I think I can get on the whole island here. And did I want a free cookie with that – hell yes I did- thank you very much. I behaved like a total idiot the whole weekend, asking silly questions, being far too outspoken, shouting out “look at THAT!” at all the things they found quite ordinary. And you won't believe how long it took me to work out in my hire car that there simply isn't a place to put the ignition key – the car starts without it. Huh? I hadn't realised quite how far behind the modern times we are out here on a small island. It was like landing on a much more advanced alien world! But an alien world that had shops! But wow, was it COLD! That's me wearing the thermal underwear and 2 sweaters while the girls dance around in short sleeve t-shirts telling me how lovely and warm it is for this time of year. Er, no. It's below freezing surely…I was lucky not to catch frostbite. Sadly the customs police only allow a limited amount of shopping to be brought back into Cayman so I had to strictly limit myself. Once I'd bought my new Christmas present, there wasn't much of my allowance left for fabric, so I had to shop carefully and try to think about what I would need for upcoming projects, make sure I bought thread and zips to match and not just get carried away with all the bright colors and phenomenal choice. So I brought back my shiny new serger, a fairly modest selection of fabric for upcoming bag projects and a couple of bra making kits for use in the Craftsy Bra Making class. Learning to use my serger and making a bra that actually fits me is my challenge for the New Year. Not necessarily at the same time. 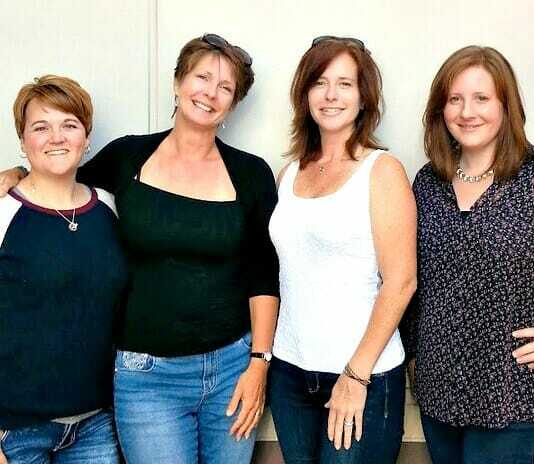 A big thank you to Heather, Becky and Molly who made my trip such a lot of fun. I enjoyed reading your post, the grand time you had and how cold it was! Keep it up! I’ve been looking for a new serger and I guess I know which one I’m going to get now! lol And with the weather factor… it’s 10 C here in Toronto now… I’d be in shorts and a T shirt for 70F! lol Thanks for your posting. I’m glad you had a good time. I’m so glad you got to shop at a real fabric store but would have loved to be there to see you dancing around and giggling! That is so cute! I love the way you write about everything! But I agree with you about the 70 degrees and wearing sweaters! When we lived in Las Vegas my husband would come home from work and ask why I didn’t have the air conditioner on. He would turn it on and I would go get a sweater. He thought it was funny but my cold bones didn’t! Looks like you had so much fun. I have been to your island and loved it dearly. Such a quaint beautiful place. I even swam with the sting ray … Really!?!? So much fun. But I understand why you must have thought you had died and gone to heaven. Not much shopping there. Kind of like driving to Phoenix when you live in Flagstaff . . . But it doesn’t take as long. So cute! Thank you for posting about your “new” friends and all of your antics! I do have a fabric shop about 30 minutes from me but they don’t carry a lot of things I like. Where would we be without our Craftsy?? Enjoy your new serger. Learning about and having one is definitely on my bucket list! Deby, both Joe and I got a kick out of reading about your adventure. I look forward to seeing new projects with your Christmas gift, and particularly the bras! We both laughed that you were wearing sandals in the cold, along with your thermals!! And, I love your new skirt with pockets. That will be a purchase for me for sure! Thanks!! 70s!!! I’d call that a nice day! No wonder the others were in short sleeves!! I’d have been sleeveless and shorts! Ha ha! I lived in Charlotte NC for ten years. I LOVED MaryJo’s. It is worth the experience. Did you know they have a website? http://www.maryjos.com. I hope you enjoy your fabric haul. 🙂 Have a great day. I am only jealous that I couldn’t meet you. 🙂 I am way in the middle (STL, MO). You are going to love a serger. I treated myself to a new model when I retired last year (8 threads). Well, I haven’t ventured past using 4 threads, but I wouldn’t sew without my serger. You are going to love it. So glad you wrote about your trip. Oh, I ordered some labels from the link on your page. Anxious to see what they look like. Omg Deby I can’t believe you were at Mary Jo’s, I live nearby! Glad you had fun! Sorry to have missed you Laura. If I ever plan another trip to the USA I’ll make sure to let people know so we can have a big sewing meetup. I love Mary Jo’s! So glad you had such a lovely trip. Looks like it was a fun shopping expedition. Looks like you had a fun and bountiful trip. Make sure to post about serging. I’ve only had mine a few months and haven’t accomplished anything other than changing out the thread and breaking a needle! We had such a wonderful time. Glad you were able to stand our antics and teases. 🙂 You are a great friend and I hope to see you again next year! Deby, glad you had a wonderful trip. 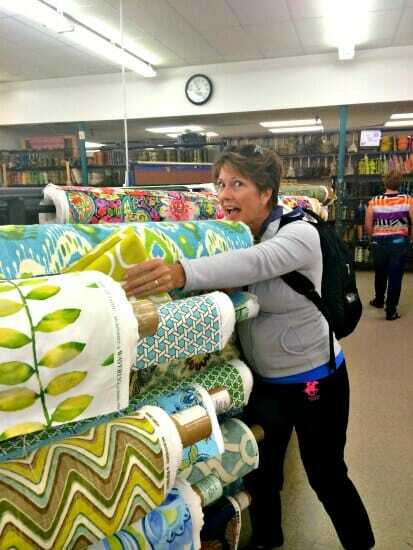 I have heard that Mary Jo’s is an amazing fabric store. Some day I will get there, and congrats on your new serger. You will love it. That hire car is not typical of USA cars – yet, though the world may be headed that way. At present, there are still many cars that do require an ignition key, including the new 2015 Toyota Corolla LE my husband recently purchased. I am envious of your shopping trip – all that gorgeous fabric to choose from. There is not one fabric shop in my town. Merry Christmas, Deby; hope you enjoy all the wonderful purchases you made on your visit to this country. I’m so glad you enjoyed Mary Jo’s. Wish I had known you were in town. Would have loved to meet you and other local sewers. I didn’t know where they were going to take me, and it was all a bit last minute! We should have a great big sewing meet up in Cayman one day – you are all invited. Lol! the closest store here in Iowa to me Is 26 miles away, my friends laugh at me because I have to schedule at least 2 or 3 hours just so I could drool through the whole store. If I’m that bad I can imagine you’re lucky not to have suffered a cerebral hemorrhage going through an actual fabric store:) Just do as I do and keep a hanky in your pocket. It actually made me pretty speechless to start with, then I couldn’t stop running about and giggling! Such fun. So glad you had a lovely trip here to the US! Congrats on your haul!! I have that same serger and LOVE IT! !